These tabletop firepits run on replacable gel fuel which provide a clean burning source. 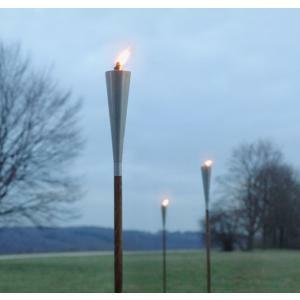 The Fuoco tabletop torches come in 2 sizes which allows for portability and convenience. The stainless steel top refects the light to give it an added brilliance. With the black ceramic and polished stainless steel finish the Fuoco Tabletop Gel Firepit is sure to add a captivating ambience and warmth to your outdoor setting. The firepits come with a stainless steel snuffer and hold two hours worth of burning gel.